On behalf of Henry Ford, E. G. Liebold encloses a check for $5,689.44 for the invoice of the Clanton & Webb Company and the McDonald Furniture Company. 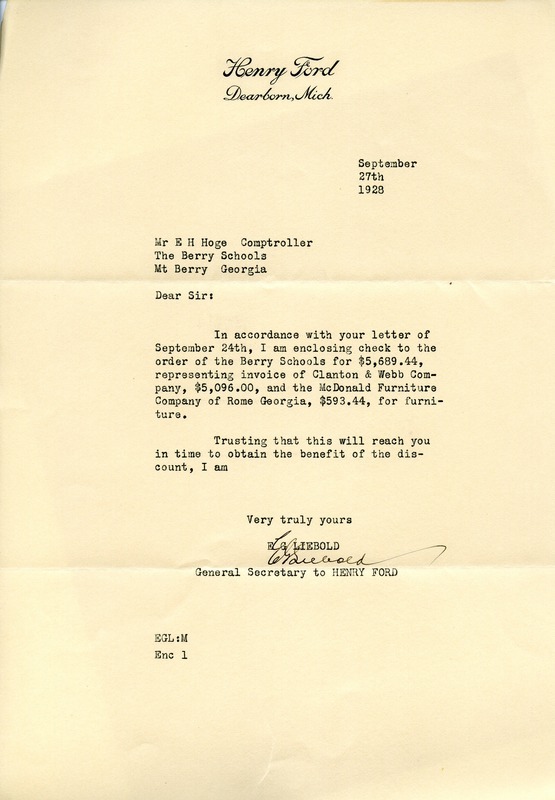 E. G. Liebold, “Letter to E. H. Hoge from E. G. Liebold.” Martha Berry Digital Archive. Eds. Schlitz, Stephanie A., Meg Ratliff, et al. Mount Berry: Berry College, 2012. accessed April 21, 2019, https://mbda.berry.edu/items/show/7492.